Fiber: Chapter 7: Colores! Colores! 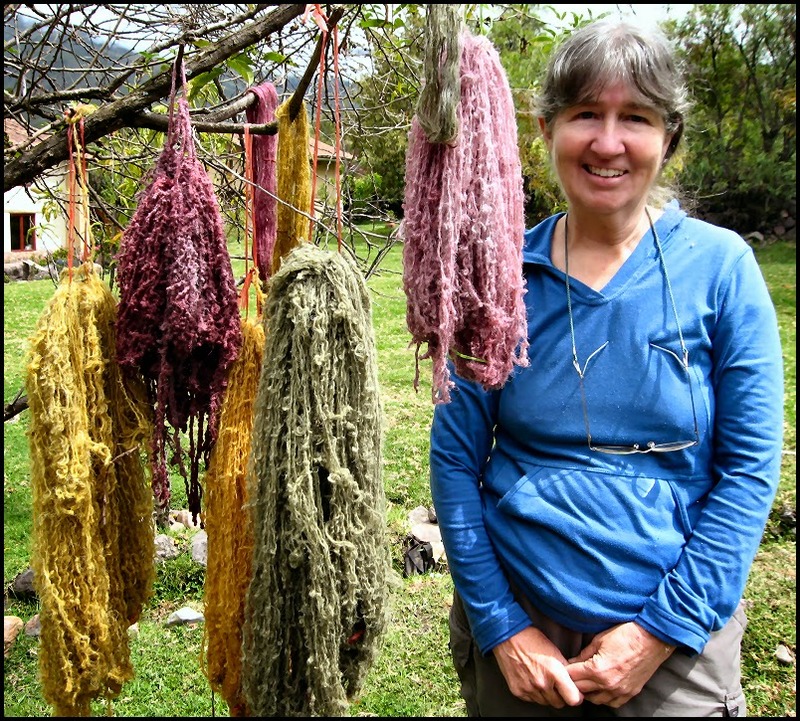 Since I arrived in Calca, I have been trying to find a natural dyeing workshop to learn how the Quechua traditionally dyed their fiber. I was especially interested in a four-day homestay in a small village sponsored by an organization called Awamaki which is located in Ollantaytambo. However, they would not have any excursions until May, after I leave Peru. But, thanks to my hosts at Casa Willkamayo, where I am living, I was referred to a local organization only blocks from here: Apulaya, which is run by Emerita Bucher and her husband, Valerio Fernandez. 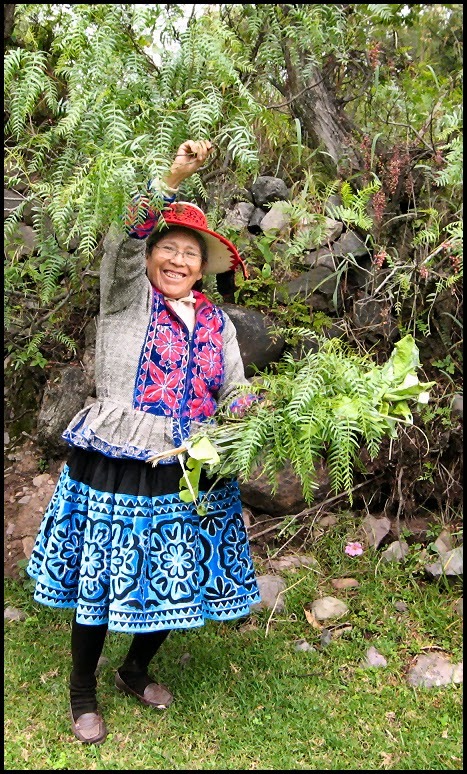 Emerita emailed me one day to say that a half-day workshop would be offered on April 12, and so I finally got the opportunity to learn about this fascinating subject first-hand from Apolonia Coronel, a sweet Quechua woman from the high Andean community of Ranra. I arrived promptly at 9:00 am to find Emerita and Apolonia busy starting the fire and heating water over a traditional Andean stove. (I want one of those little stoves in my yard!) Emerita put me to work stripping the leaves from a chilca plant which would yield a green color. 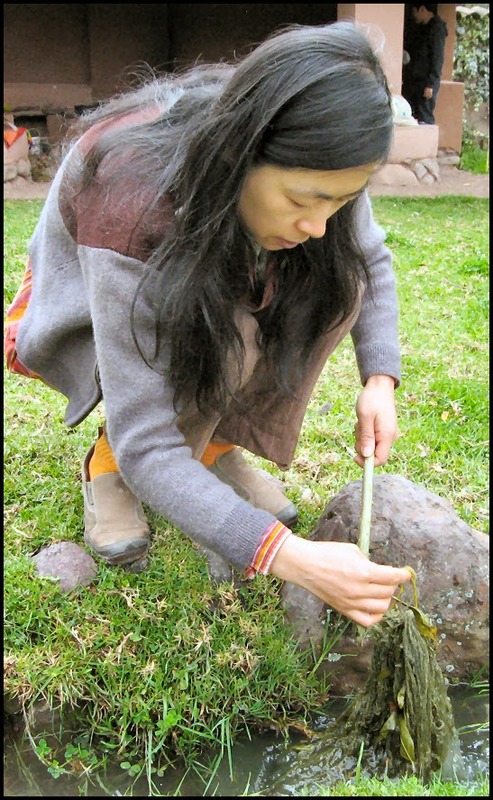 The other workshop participant, Yiqian, an artist from China, began crushing dried cochineal, an insect parasite of nopal-type cacti which yields bright red. The other dye we would be using was quiswar flowers for gold or yellow. harvest the insects, the dye is very expensive. 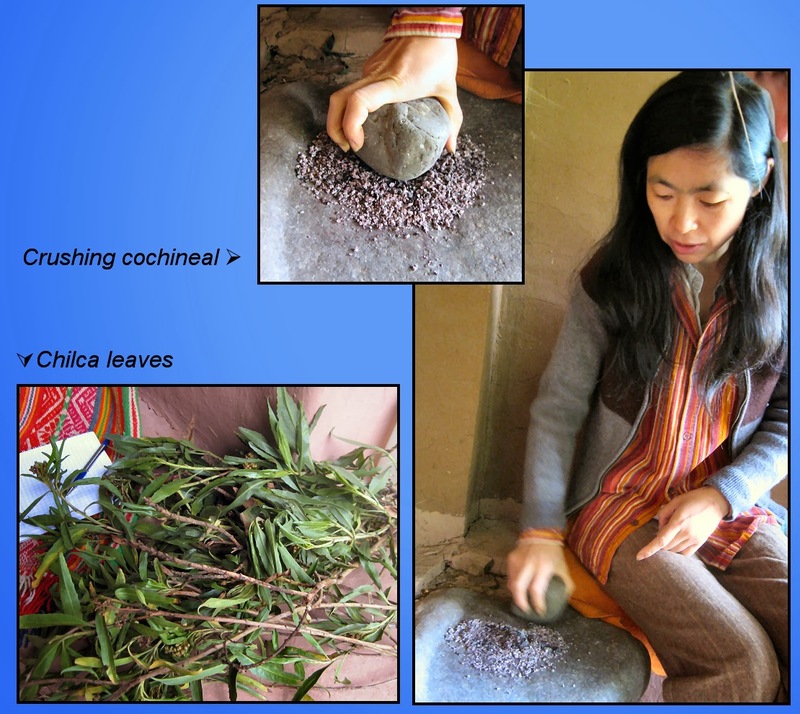 Apolonia adds chilca leaves to the dye pot. After we finished stripping the chilca leaves, Apolonia filled one of the pots so full with them that I wondered if there would be room for the yarn. She had already prepared several hanks of her handspun wool from sheep that are raised at Apulaya. The Quechua women spin “singles” (unplyed yarn) and then, holding two singles together without plying them, they create a hank by running the two yarns in figure-eights. I learned later that this keeps the yarn from tangling so bad when it is stirred around in the dye bath. And because the yarn is not plied, the dye can penetrate more evenly through the fiber. You would not believe how easy it is to separate these strands! Only after the yarn is dyed and dried, do they ply the two singles together. And despite how tangled the hank looks, believe it or not, it is very easy to pull the yarn apart to begin the plying process, particularly because the two single strands were hanked together. 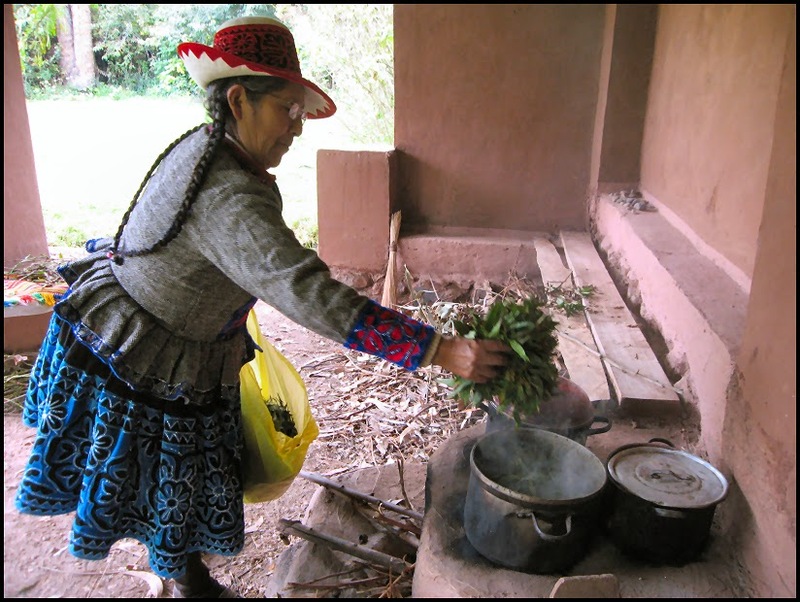 The chilca requires a mordant to help set the dye and to make different shades of green. Colpa, a local mineral, was the mordant we used. Later, eucalyptus and molle leaves were added to the dye bath to see if we would get a different color of green. Eucalyptus is not a native Andean plant, but has been imported for lumber and firewood and grows everywhere here in the Sacred Valley. 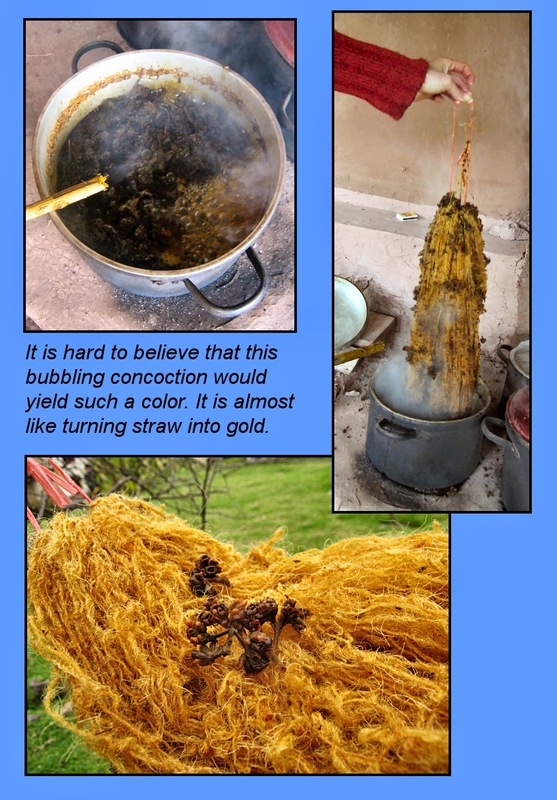 We used lemon salt as a mordant for the cochineal. If you use an acid mordant, the color is brighter; if you use an alkali mordant, the color is darker. Our lemon salt mordant resulted in a nice purple. The quiswar did not require a mordant, and the bath can be used several times—each successive hank is lighter in color. I brought a few sample hanks of some pure alpaca yarn that I had purchased in Arequipa to put in the dye baths. 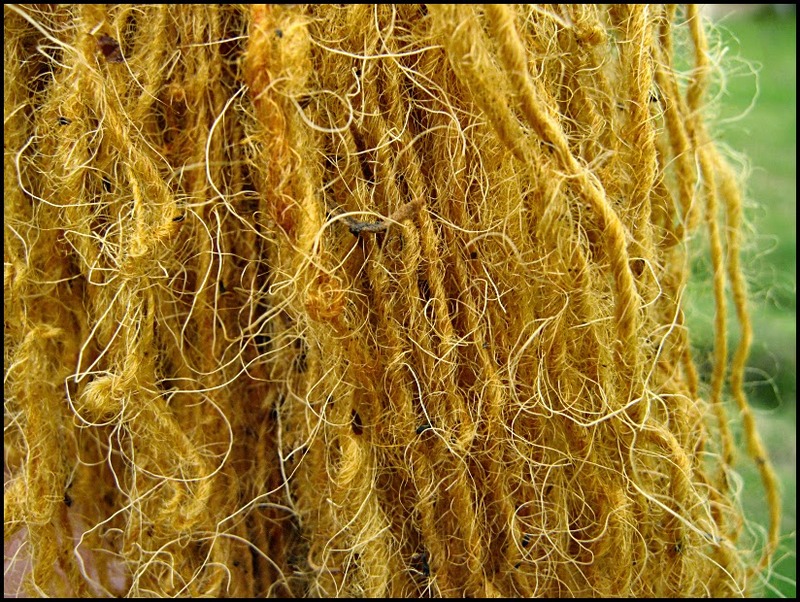 (See Revisiting Arequipa’s Fiber Mills.) One of them went into the chilca/eucalyptus/molle bath; one to the cochineal bath, and the third one to the quiswar. The hanks were allowed to boil in the baths for about 15 minutes and when we fished them out, the colors were remarkable! Yiqian washing yarn in the canal. We took them over to a canal with running water to wash out the excess dye and hung the hanks on a tree to dry. This was one of the highlights of my stay in Calca. I look forward to learning more about natural dyeing when I get home and finding out what colors our local plants in the Pacific Northwest US yield.